RP System stands for Revolutionary Preservation System. The RP System is a unique new atmospheric modification preservation system and is an excellent choice for long-term storage of artifacts over the use of Ageless. It creates an environment free of the elements that could cause your artifacts and delicate cultural treasures premature oxidation or deterioration. The RP System is used much like Ageless only it provides so much more protection. The RP System comes in two distinctly different types: Type-A and Type-K.
RP Type-A absorbs oxygen, corrosive gasses and moisture, making it the perfect choice for most any metallic objects such as archaeological iron, coins and so forth where controlling moisture is necessary to prevent further oxidation and corrosion (rust). RP Type-K absorbs oxygen, corrosive gasses and is moisture neutral making it the right choice for preservation of wood, paper, fabric, leather or any object sensitive to moisture changes which could deteriorate in an environment with too low of relative humidity. 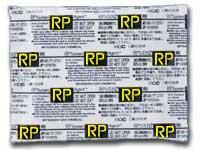 The RP System comes packaged in two different sizes RP-3 and RP-20. The RP-3 is for smaller preservation projects where as the RP-20 is useful and provides a more economical approach for larger projects. Click on the link below to calculate just how many RP packets you will need to meet your project requirements.